On a Budget – You Can Still Have a Memory Foam Mattress! If you’ve had the chance to take a look through my website, you will know that I’m not just about reviewing brands that will cost thousands of dollars. In fact, I have done my best to give a good cross section of the brands available in the hope that people who feel this type of “sleeping technology” is beyond their budget realize it’s anything but! 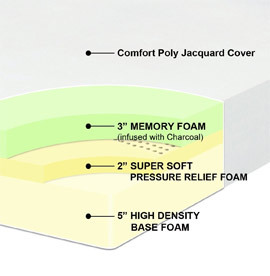 The first model of memory foam mattress I’m going to review on this page is the Best Price Memory Foam Mattress, 10 inch. OK, so as you read through the pluses and negatives you might not find this one has all the benefits a Tempurpedic will give you, but you’re not looking to spend top dollar for a mattress that will help you sleep better. So, on with the review. Considering how much this brand of memory foam mattress will cost you, I think the manufacturer has done a fine job. The 10 inch model starts with a Poly Jacquard cover complete with a zip so you can remove it easily for washing. Next, you get 3 inches of memory foam which is infused with charcoal to help keep odors at bay. Underneath that you have 2 inches of super soft pressure release foam which is where it all happens in terms of the comfort you get. At the very bottom, you benefit from 5 inches of high density base foam. All of this adds up to a mattress that will not only mould to the shape of your body, but it will also intelligently recognize the main pressure points that can cause discomfort when you sleep. When you first lie down, the top layer reacts to your body temperature and within a few minutes, it will begin to conform to your shape. The unique “pressure relief system” accommodates troublesome areas of your body like the shoulders and hips. It will even recognize that different areas need support if you turn from your back on to your side. All of this leaves you feeling like your almost lying on air, but the one point I will make is this can take a bit of getting used to if you’ve never slept on a memory foam mattress before. Heat is another issue some people might come across. Unlike the more expensive memory foam mattress, this one doesn’t come with any form of cooling system. In fact because it uses the heat from your body to mould to you, it’s probably a lot warmer than you would expect. Having said that, this problem can easily be rectified by using cool-touch sheets or less in the way of blankets over the top. This mattress is CertiPUR-US certified ensuring it only contains polyurethane foam. This helps in terms of guaranteed comfort, reduced fire risk and it’s healthier for the environment. The manufacturer also offers a 10 year warranty. You can buy this 10 inch model in the following sizes: Twin, Full, Queen and King. You will get all the benefits mentioned above but what you should bear in mind is the level of firmness. The layers inside are almost the same except for the following: The memory foam on top is 2 inches in depth, and instead of the super soft pressure release foam you get 2 inches of ventilated cool foam. The high density base foam is 4 inches in depth. The addition of the ventilated cool foam is probably something a lot of people would like with the 10 inch version because this helps to negate issues with feeling too hot overnight. However, you do still get the “cradle” effect when you lie down due to the way in which the top layer reacts to body temperature. This one is available in: Twin, Full, Queen, King and Twin XL. If you decide to opt for one of these memory foam mattresses, it will be delivered rolled and vacuum packed. This makes it much easier to get to a second floor, but no matter where you intend to use it I recommend you don’t unpack it until you have it in place. Of course, you will need to give both models time to expand and you may get a slight “off gassing” odor, but I have come across few complaints that this can be an issue. Overall, if you’re on a budget or want to try memory foam for the first time, I think these are a great option. The price will really surprise you as well. Just take a look at Amazon for the 10 Inch model or the 8 inch model. The last time I looked they had some great discounts on offer as well as next day delivery.